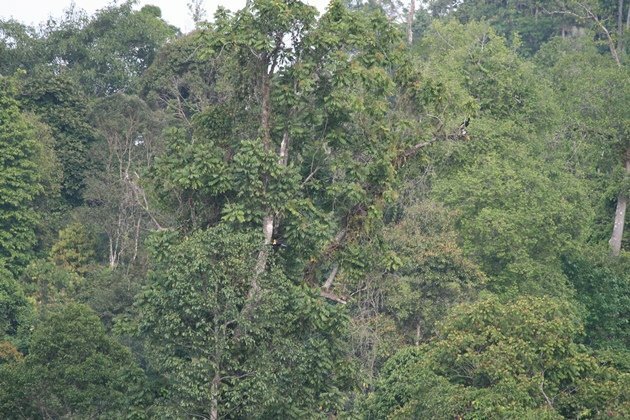 You’d think that dressing in green to hide from predators inside a dense rainforest is as a strategy as plain as day, yet only a surprisingly limited number of bird species on Borneo have ventured down that evolutionary road. In fact, flipping through your field guide of choice will reveal a dominance of browns and an abundance of blues, but a bright green is hard to come by. There are a few groups that have their fair share of green species, like the broadbills and the barbets, and of course you have the usual female dull stuff, e.g. amongst the sunbirds, spiderhunters and flowerpeckers. But there really is only one bird family (in a taxonomic sense) that continuously sets the benchmark for how green a green bird should really be: the Chloropseidae, the Leafbirds. Leafbirds are a group of currently eleven species inhabiting the Indian subcontinent and most of SE Asia – “currently” since some splits might be headed our way. 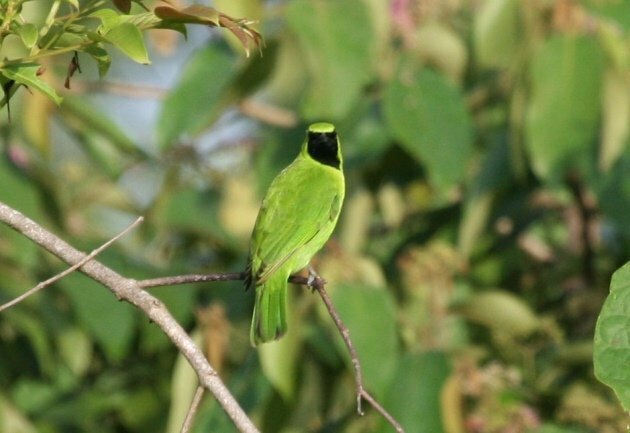 As their bright green plumage suggests, they are predominantly arboreal and search the canopy for invertebrates and – on occasion – fruit and nectar. The males of most species are very similar, with a green plumage and a black face and throat, a fact that renders them a veritable identification challenge. Interestingly, the females are more varied between the species and are far more readily identified. Fun fact: Their camouflage strategy and dependence on deciduous tree species has kept them from expanding into more temperate zones since the constant moult to adapt to the changing autumn colours would overstrain their metabolism. Which may or may not be true. 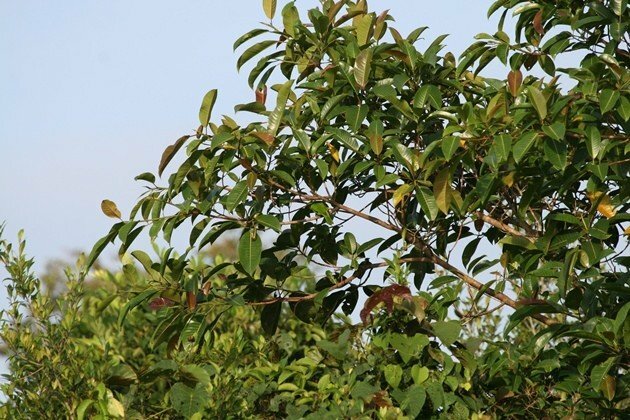 Borneo is a very suitable place for anyone seeking to sort the leafbirds from the leaves since no less than four species (a good third of the world’s total) call this island their cozy home. 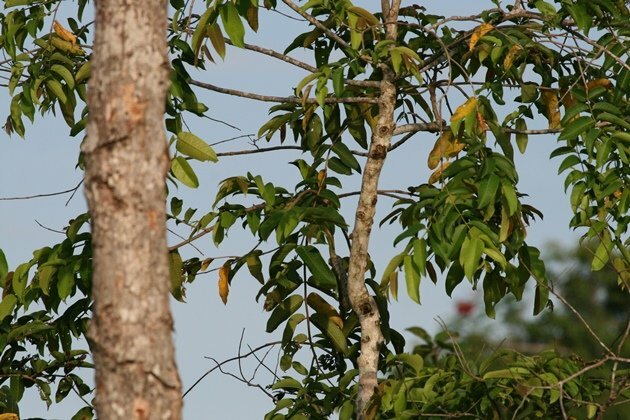 But you see, not only has Borneo a lot of leafbirds – it has a heck of a lot of leaves, too. A typical view into the canopy of a Bornean forest in S Kalimantan. I know this picture has leaves. I am equally certain this picture contains birds. 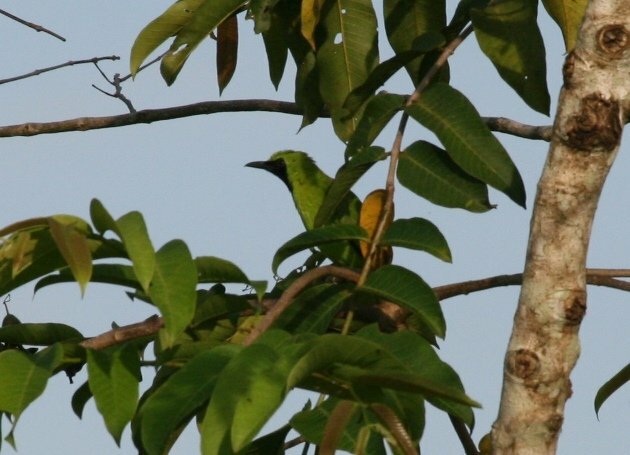 It probably shows a leafbird, too if you just look hard enough. But to be honest, I may be crazy – but not to that extend. 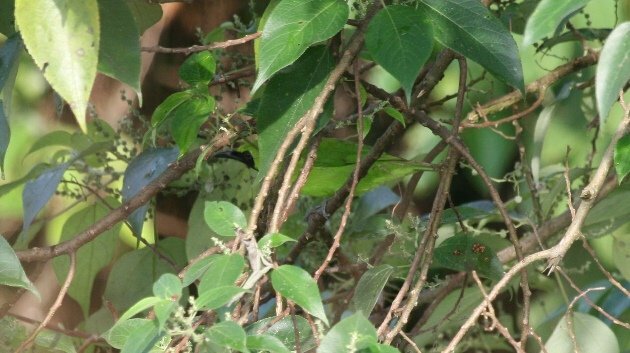 This picture does indeed contain a leafbird and some leaves. But which is which? Okay, here it is, cropped and facing our way. I am fairly certain it is a male Greater Leafbird. Well, I was certain when I saw it in the field. Next try: tree, leaves, leafbird. Which is which? Again, it was right in the centre of the picture. This is an easy one. Again, my guess is Greater Leafbird. 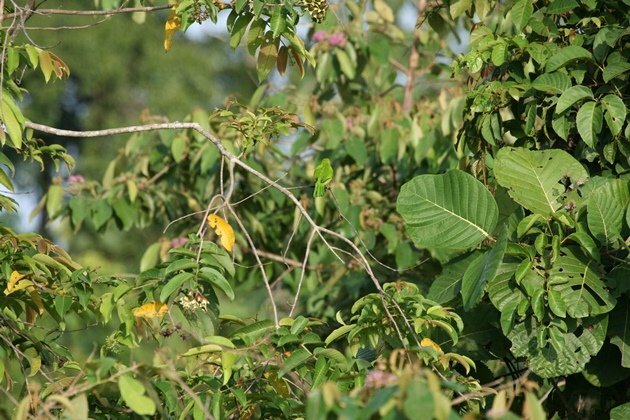 However, I may know this bird from the leaves – but I am not so certain about the species identification. As if the spotting of the bird itself wasn’t hard already. You know, I sometimes think European birders whinge and whine too much about having to tell their reed warblers from their reeds. It really ain’t that much of a unique selling point of the West Palaearctic region. I thought the hardest Leaf Bird to find was the last photo, the one you say is easy. I’ve often thought that birders who are able to pick these birds out in the field in three seconds (and you know they exist) have a heightened ability to see contrast in similarly colored shapes. The rest of us need to learn by experience. And hurting our eyes. Hope you had many good birds in Indonesia! Honestly, I rely on movement and sound to pick these up. I am crap at spotting perched camouflaged birds, like frogmouths, trogons and so on. Well, witnessing the scale of this year’s forest destruction in Indonesia was very, very grim and a truly depressing experience. So much lost, forever. But I did see many outrageously handsome birds, e.g. several pitta encounters, finally a trogon etc., and a tree full of leafbirds, too! So all in all I sincerely can’t complain!